The University of the Fraser Valley wrestling program combined for three individual medals at the Simon Fraser University International, held Saturday in Burnaby. Two of those medals came on the women’s side. Glaysia Sparling took silver in the 90-kilogram weight class, posting a 2-2 record in her division’s round-robin format and finishing second via tiebreaking procedures. Karla Godinez Gonzalez won bronze at 57 kg – she lost her opening match, but bounced back to win three in a row on the back side of the draw. Her run to the podium was highlighted by a victory over Hannah Franson of the Calgary Dinos, a wrestler who has represented Canada internationally. On the men’s side, Brad Hildenbrandt posted a pair of third-place results on the weekend. On Friday, he took third in the Commonwealth Games trials, and on Saturday, he matched that finish at the SFU event, posting a 3-1 record in the 125 kg division. 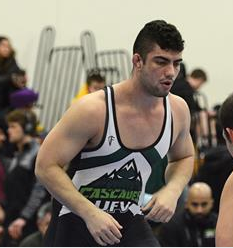 Three other Cascades male wrestlers placed. Karan Dhillon (70 kg) and De’Andre Williams (74 kg) both finished fifth, and Jacob Torres (61 kg) was sixth despite pulling out of the tournament partway through due to injury. Cascades head coach Raj Virdi was extremely pleased with his team’s collective performance, in light of the high calibre of competition due to international makeup of the field and the Commonwealth Games trials running in conjunction. The event featured an Olympic champ (Erica Wiebe, Calgary Dinos, women’s 76 kg), a world junior and Commonwealth Games champ (Danielle Lappage, Calgary Dinos, women’s 68 kg), an NCAA champ (Corey Clark, Iowa Hawkeyes, men’s 61 kg), and an NCAA All-American (Joey Palmer, Oregon State, men’s 61 kg). Virdi was particularly pleased with the performances of Hildenbrandt and Godinez Gonzalez in stacked weight classes. “The big thing about Brad is, you can see he’s developing into a senior national-calibre wrestler,” Virdi said of Hildenbrandt, who won the U SPORTS national title last season. “He’s going to be a medal contender at senior nationals this year, for sure. Arjan (Bhullar, Cascades assistant coach) and I both believe that. Be the first to comment on "Three UFV Wrestlers Climb Podium At SFU Tournament"